Months of unprecedented California wildfires keep raging – the most destructive and deadly in state history, so far around 1.7 million acres destroyed. Through Saturday, 76 fatalities were reported, nearly 1,300 others missing – the number rising from 265 on Friday. Official numbers keep increasing. The death toll already likely exceeds 1,000. Countless bodies remain to be discovered. 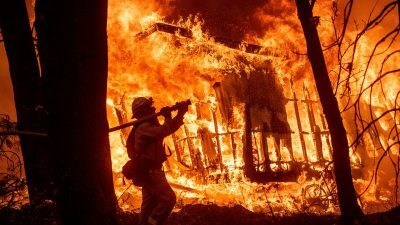 As of November 11, an astonishing 7,579 fires are burning, according to the California Department of Forestry and Fire Protection and the National Interagency Fire Center – costing around $3 billion in destruction and damage so far. California’s Department of Toxic Substance Control said it found no evidence of radioactive or other hazardous materials in affected areas. SSFL was involved in testing rocket engines and nuclear energy research. In 1959, one of its nuclear reactors had a partial meltdown. Communities nears its facilities have battled for decontamination, residents blaming serious illnesses on contamination from SSFL operations. Dense smoke called “the dirtiest air in the world” threatens areas near raging blazes, a major potential health hazard if contaminants spread over parts of the state. Santa Ana winds up to 50 MPH keep spreading flames while firefighters battle them, “a disheartening situation,” said Butte County sheriff Kory Honea. Blazes affect areas north of Sacramento and southern parts of the state in Los Angeles and Ventura counties. Since the 1980s, the frequency and duration of wildfires increased. Further climate change ahead elevates the potential for more devastating blazes in US western areas and in other countries. “As the world warms, we can expect more wildfires,” the UCS stressed. In California alone, millions of homes in coastal and inland areas are potentially threatened. Environmental and health costs threaten affected areas and their residents, increasing the risk of widespread respiratory and other diseases. Loss of vegetation increases the chance for destructive flash floods in low-lying areas during rainy season. Human activity is largely responsible for what’s going on. If environmentally destructive behavior continues, things ahead will likely be much worse than already. It’s why government-mandated changes are vital, including the shift from fossil fuels and nuclear energy producing greenhouse gases to clean renewable green sources. “With proper forest management, we can stop the devastation constantly going on in California.” He failed to explain that around 60% of state forest areas are federally managed. As long as he and many others in Washington are dismissive of climate change and other environmental factors affecting wildfires and other natural disasters, they’ll continue and likely worsen.